Here is a photo taken from my house at 7:25pm CDT. The wind at my house was dead calm. But, at the top of the photo, I could see a "gust front" approaching. 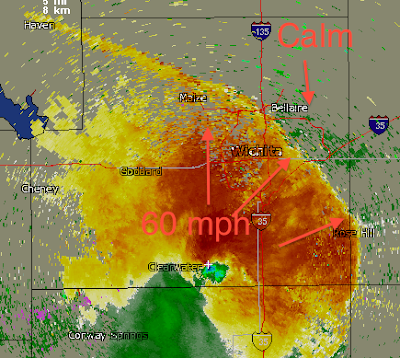 But, the Doppler radar indicates that strong winds are occurring behind the gust front. Shortly before this image was created, there were three reports of 70 to 75 mph in southern Sedgwick County. The gust front just came past our house and we had winds of 35 to 40 mph.